"Grandma's recipe for yeast dough for pirozhki, which are Russian buns stuffed with sweet or savory fillings. The dough can also be used for plain rolls or buns." Combine lukewarm milk and 2 tablespoons sugar in a large bowl and stir to dissolve sugar. Mix 3 tablespoons flour with fresh yeast in a small bowl and add to milk mixture. Let rest in a warm place until mixture is frothy, 15 to 30 minutes. Beat 3 eggs and 3 tablespoons sugar together in a small bowl. Add to the yeast mixture; stir in melted butter. Add 8 cups flour and salt. Mix until well combined and a soft dough forms; no kneading is necessary. Place dough in an oiled bowl, cover with plastic wrap, and let rise in a warm place until doubled in size, 1 to 2 hours. Punch down dough. Cover and let rise until doubled in volume once again, about 40 minutes. Turn dough onto a lightly floured surface. 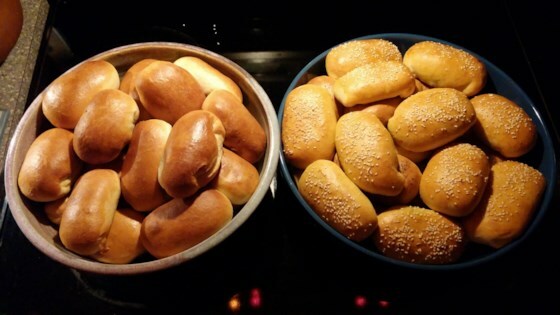 Divide dough into 24 equal pieces, or according to your preferred pirozhki recipe, and form into rolls. Place rolls on a lightly greased baking sheet. Beat the remaining egg in a small bowl and glaze rolls with the beaten egg. Cover with a clean kitchen towel and let rest, 20 to 30 minutes. Uncover and bake rolls in the preheated oven until golden, about 15 minutes. Watch how to make this traditional sweet yeast bread at home! You can use margarine in place of butter.